Pullups are an exercise traditionally used to measure upper body strength and endurance. The pullup is performed by gripping an elevated straight-bar with an overhand grip and pulling up so that your chin is at bar level. The average number of pullups a man can do typically depends on his current age. Pullups strengthen and improve the physique of your back, biceps and forearms when used for exercise. Always consult a doctor before beginning a new exercise regimen. The President's Council on Physical Fitness and Sports states that the 50th percentile for pullups for males ages 6 to 12 are 1 to 2 full repetitions. Specifically, boys ages 6 to 9 are expected to perform 1 pullup for the 50th percentile while boys ages 10 to 12 are expected to perform 2 pullups. There is no time limit; a child can take as long as he needs to perform the pullups. The President's Council raises the number of pullups required to meet the 50th percentile for teenagers by several repetitions. Thirteen-year-old males are expected to perform three pullups. Fourteen-year-olds are expected to perform 2 more reps for a total of 5 reps for meeting the 50th percentile. Fifteen-year-olds are expected to complete 6 reps; while 16-year-olds typically do 7 reps, and 18-year-olds do 8 reps. There's no specific time limit on how long it may take a teen to perform the pullups. Males over the age of 18 are expected to perform 8 repetitions of pullups to be classified as in "borderline shape" according to the President's Council. 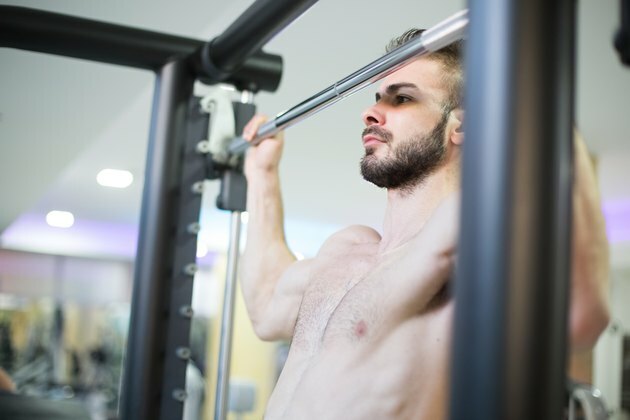 The average number of pullups a male can do begins to decline around the 31 to 50 age bracket, and is normally associated with a decline in physical activity and an increase in weight. The world record holder in number of repetitions in 1 minute is the Vitaly Kulikov from Russia, who performed 59 pullups in a scant 60 seconds in 2012. The record for most pullups in 24 hours is held by Jan Kareš of the Czech Republic, who performed 4,620 pullups in 22:55 hours in 2011. Military pullup averages and standards depend on branch of service and level of fitness required for the specific assigned duty. Enlistees into the United States Marine Corp must be able to perform at least 3 pullups; however, a score of 50 percent is met with a total of 10 pullups completed. Unlike other military athletic tests such as crunches and the 3-mile run, pullup tests have no set time limit. Military members undergo a physical fitness assessment once or twice a year, depending on the branch of service, and must fulfill the minimum standards of fitness to remain on active duty. The President's Challenge: Get Fit -- The Time Is Now! The President's Challenge: Stay Active and Be Fit! Connecticut State Department of Education: Physical Activity -- Physical Education -- What’s the Difference?